Cherie Enns, Kathy Kiever, and Amber Johnston, 2018 winners of the Teaching, Research, and Service categories of the Faculty Excellence awards. 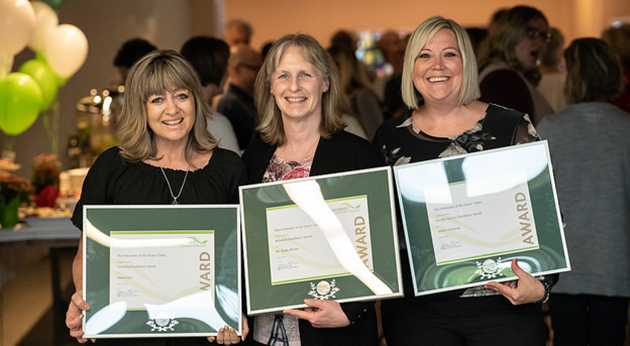 At UFV, we believe in honouring excellence and recognizing outstanding achievement and service. To do so, we need your help in the form of nominations. Let us know who deserves to be recognized! Let a UFV faculty member or lab instructor know they’ve made a difference. Nominate an outstanding instructor in recognition of their excellence in teaching, research, or service. Nominations for any of the three faculty excellence awards may be made by students, alumni, staff, faculty, or university officers. Award recipients will receive a personalized plaque, a framed certificate, and a $2,500 award, to be presented at a special award ceremony. Learn more or submit your nomination here. Questions? Contact nancy.scarrow@ufv.ca or 604-557-4065. The President’s office is seeking nominations for the 2019 Honorary Degrees. Please see the details of the search procedure noted below. Thank you for any ideas you may have. 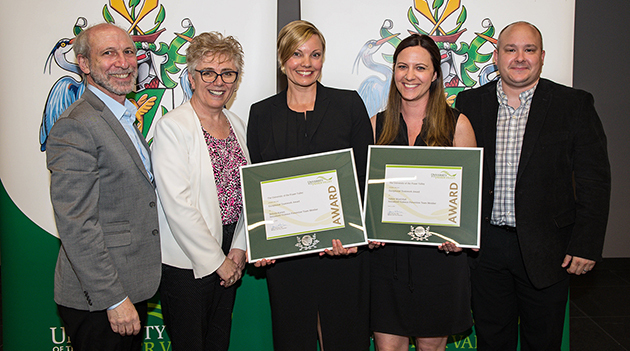 UFV employees, students, alumni, and members of the Board of Governors may make nominations for the award of honorary degrees. Honorary degrees will be awarded at the June 2019 UFV convocation ceremonies. Recipients of honorary degrees will be asked to attend the UFV convocation ceremonies to receive the award, and would be expected to make a short address at convocation. Nominees shall not be current members of the UFV Board of Governors, UFV employees, students at UFV, or individuals who have direct political, legal or budgetary authority over UFV. Awards will not normally be granted posthumously. Candidates will have made outstanding contributions which are regional, provincial, national or international in scope. Candidates’ contributions must be consistent with the mission and values of UFV. Nominations will be considered with reference to the following “benchmarks”. While a candidate might not be expected to fulfill all of these criteria, they will be used as overall measures of the candidate’s suitability. Has the nominee made a significant contribution to the spirit of inquiry, learning and social progress, and enrichment of the quality of life and imagination? Has the nominee extended the boundaries of the human experience in some manner? Is the nominee an exemplar of noteworthy public service? Is the nominee distinguished and widely recognized? Is the nominee’s achievement relevant and appropriate to UFV? Nomination Guidelines: Nominations must be in writing. Examples of such supporting documents might include a biography, lists of the nominee’s referred publications, shows, or public performances, or documentation of other honors received by the nominee. The Selection Committee reserves the right to request further information. The Selection Committee will start reviewing nominations in Fall 2018. Nominations for 2019 will close by the end of January. Please note: nominations are accepted year round and are brought forward each Fall. Nominations may be sent to Lisa McMartin, Executive Assistant to the President at lisa.mcmartin@ufv.ca. Please go to http://www.ufv.ca/board/honorary-degrees-at-ufv for a link to the Honorary Doctorate Degrees policy.